There is nothing quite like feeling like you feed a small army every morning. I may only have a 5, 3, and 1 year old, but man these little things can put the food away! They love breakfast, and most mornings of the week it is our family’s biggest meal of the day. I have a bit of a breakfast rotation every week, but on the weekends I try to pick at least one of the mornings to make something different – and make it big so that I have leftovers to take advantage of for quick morning breakfasts on busy school days. 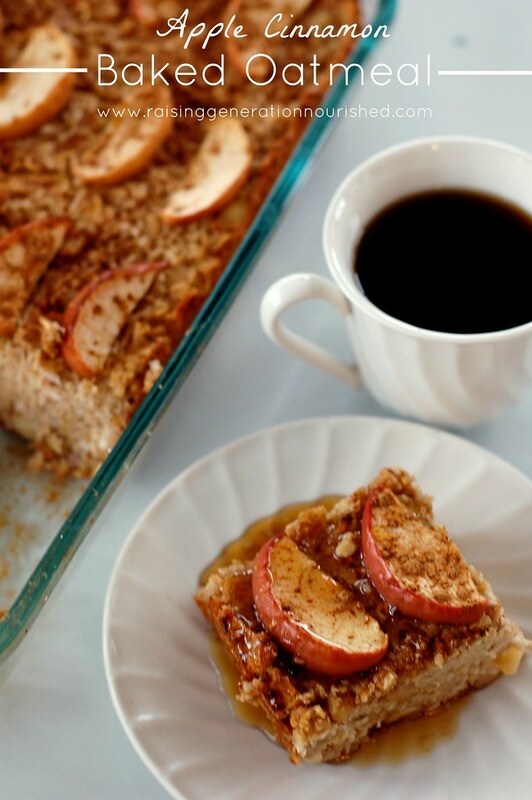 I make this baked oatmeal about once a month during the cold fall and winter months . 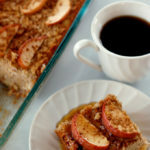 The baked apples inside make every bite taste more like a slice of apple pie or apple cake dessert than breakfast! This recipe definintely is enough to feed a crowd for a holiday or birthday brunch. I make it this size for just my family and love using the leftovers throughout the next week for quick breakfasts! The squares of oatmeal fry up so great in a pan with butter, or warm up in the oven while you get ready for school. You can also freeze the squares individually if you want. I usually serve small slices of the baked oatmeal with pats of butter and a side of sausage patties or fried eggs to balance everything out. 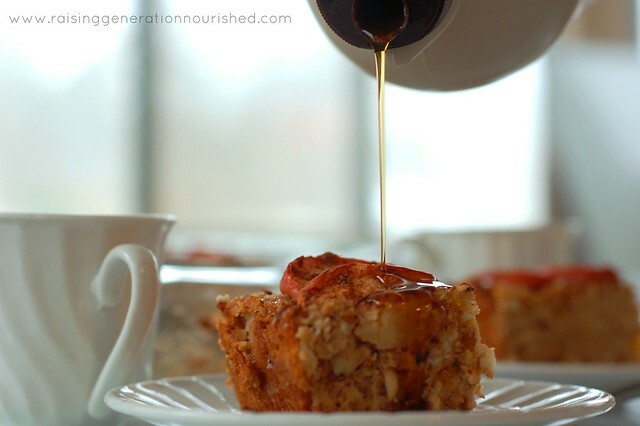 The oatmeal squares are plenty sweet for my kids but sometimes a drizzle of maple syrup or raw honey over top is just perfect! Prep the majority of this the night before so the morning goes fast! After you get your soaking mixture going you might as well get the rest of the dry ingredients into a bowl so it goes faster in the morning. Even butter your baking dish so it is all ready to go! I love making this since it means leftovers for at least a couple of days. 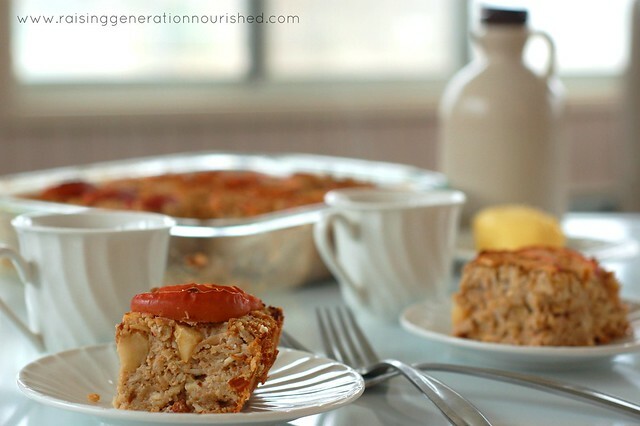 Baked oatmeal is filling and simple and made with real food. 2 cups unsweetened applesauce I use my own simple baked applesauce - if you use store bought you may want to add more cinnamon and maybe cloves or nutmeg for more flavor! 2 tsp almond extract vanilla extract would work too, but the almond extract is so amazing in this! 1-2 apples sliced for the top This is optional but pretty! The night before you make the baked oatmeal, put the nuts, oats, lemon juice, and sea salt in a large mixing bowl and fill with water to cover by an inch. Give it a stir to combine and leave the bowl in a warm spot in your kitchen over night. This soaking process helps the oats and nuts digest better, and makes more of their nutrients available to absorb. The next morning put the oat mixture in a strainer to drain. While the oat mixture drains, put the rest of the ingredients except the sliced apples for the top into the large mixing bowl, and combine it with the drained oat mixture. 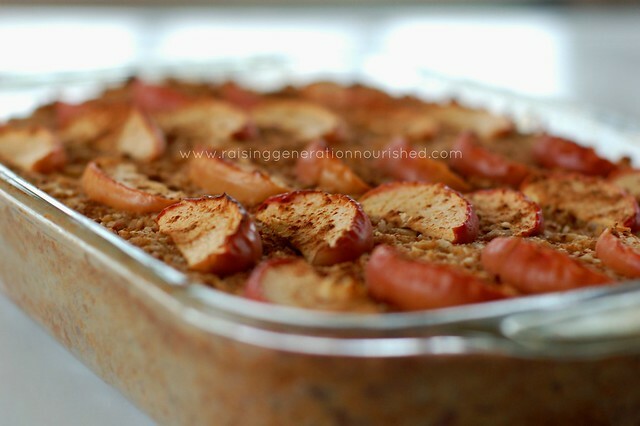 Pour the batter into a buttered 9x13 baking dish, top with sliced apples, sprinkle with cinnamon, and bake uncovered at 375 degrees for 1 hour. 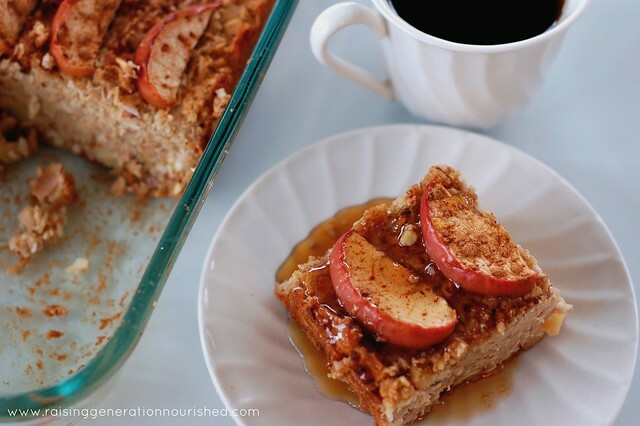 Let the baked oatmeal cool about 10 minutes before cutting. 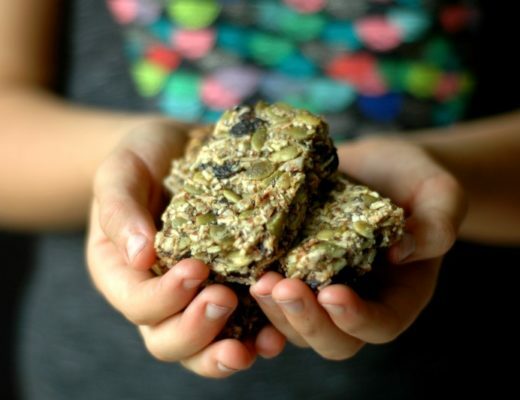 Healthy Homemade Nut Free Granola Bars :: Nut Free School Zone Safe and Naturally Refined Sugar Free! Ooh. I’m still on the GAPS Diet, but my children would LOVE this! And I’ve always liked overnight slow cooker breakfast recipes. Used to make an overnight buckwheat that tasted great with sliced bananas and maple syrup. Also, loved to make yams in the crock pot overnight for breakfast. This looks beautiful, comforting and nourishing! And your photography is looking really gorgeous! Interesting! I’ve never tried this before… baking oatmeal like that. Looks like it would be a tasty treat. Ooooh…yum. I LOVE using oats in desserts. I bet this is super delicious. This looks amazing. We are also gluten-free and I think this will be a beautiful way to begin 2015! Thank you and Happy New Year! Great Julie! Happy New Year to you as well! Any suggestions for a substitute for almond flour? My friend liked the idea of this recipe but that isn’t an ingredient she would have on hand. and its also an $$$ one to buy. You can sub any other gluten free flour for the almond flour – white or brown rice flour, sorghum flour, millet, or even corn flour – whatever she can tolerate. I would not use coconut flour as it will dry it out – or if you do just half the amount of flour if using the coconut flour. Does that help some? That’s the best part 😉 Enjoy it! We just love this recipe. It is so easy and very forgiving if your measurements aren’t exact. Perfect recipe for a child to do almost all on her own! And I love how easy it is to freeze in individual portions! A favorite at our house! Great Beth! Thank you for coming back to let us know! I made this for the first time yesterday and it came out extremely moist – is that the consistency it is supposed to have upon finishing in the oven? 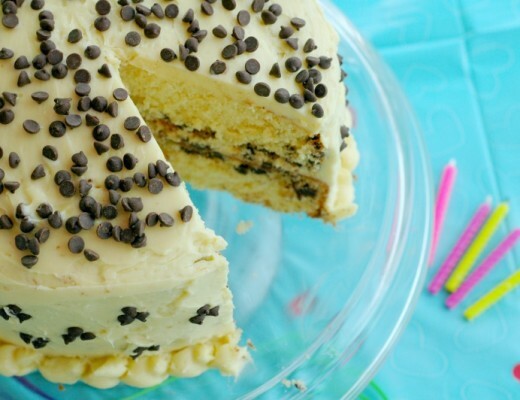 It’s very yummy and my little guys still loved it – but I’m just curious how it should be. Hi Kami! It may need a little extra cook time – our ovens might run slightly differently. Or maybe your apples were juicier!